Egyptian and Russian officials held a joint press conference in Moscow Thursday and reiterated the increased cooperation between the two countries. “Naturally, we discussed bilateral relations and there is an interest in developing economic ties through a bilateral committee next month that will have specific proposals working toward the interest of both nations,” Fahmy later told the press of his meeting with Lavrov. Fahmy was accompanied by Egyptian Defence Minister Field Marshall Abdel-Fatah El-Sissi who is on his first visit overseas since the military pushed out former President Mohamad Morsi, currently on trial for a number of charges including breaking out of jail in 2011. 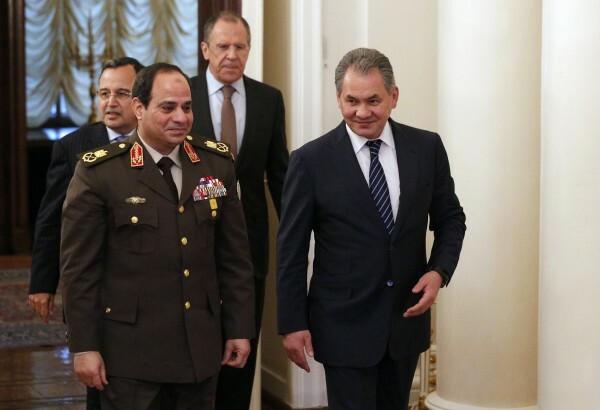 According to Russian press, El-Sissi met separately with Russia’s Defence Minister Sergei Shoigu who said that there is common ground between Cairo and Moscow, chiefly in facing the global challenges and threats from regional terrorism. Egypt recently classified the Muslim Brotherhood a terrorist group after an attack on a security headquarters in the northern city of Mansoura killed and wounded dozens. Russia has also been fighting its own Islamist and separatist rebellions in the Caucasus. “We also discussed the ways of expanding cooperation between our air forces and navies,” Shoigu told Reuters, adding that Egyptian officers could receive training in Russian military facilities. The Russian Itar-Tass news agency also quoted Shoigu as saying that Moscow wants to see a “strong and stable Egypt”. “We watch the development of events in your country. We’re pleased with the fact that Egypt has adopted a new constitution at a nationwide referendum,” he said. The Egyptian delegation’s visit to Cairo has received much local press. State-run newspaper Al Ahram said in its lead story that El-Sissi was in Russia to build a “strategic partnership”. The daily AlMasry AlYoum said that “Egyptian-Russian ties have now entered a new phase”. In November, Lavrov and Shoigu arrived in Cairo amid regional media speculation that the strengthening of Egyptian-Russian ties – particularly with emphasis on the military dimension – represents a significant paradigm shift which could see alliances realigned in the Middle East. The former Soviet Union was Egypt’s main arms supplier until 1972. Following the 1973 October (Yom Kippur) War and with the signing of the 1978/1979 Egypt-Israel Peace Accord and Treaty, the US became the Egyptian government’s greatest Western backer. Under the tenets of the Treaty, the US has supplied economic and military assistance to Egypt’s government since 1979. However, two years of tense ties since President Hosni Mubarak was ousted boiled over in July 2013 when the military stepped in – following a populist uprising – to remove a democratically elected president. Washington did not outright condemn what US media called a military coup; it did, however, pressure the interim government to quickly hold elections and show restraint in dealing with the Muslim Brotherhood. In August, the Pentagon canceled military drills with the Egyptian army and two months later, portions of the US aid package were suspended. El-Sissi is scheduled to meet Putin later on Thursday.